Something, in the lake of a small town, is killing innocent people. YAY for Amy Acker, who I remember is in this episode, a.k.a. Fred from Angel. Hmm, maybe a rewatch and blog of Angel is in my future. Okay this starts out kind of creepy because I don’t like swimming in water that’s too deep and dark to see the bottom. I love that the ladies love Dean. They did portray him as some sort of ladies’ man, didn’t they, at the beginning of the series? And of course here comes an argument. These two had better get used to fighting, because it’s going to keep happening over the next ten seasons! I love that Amy Acker’s character burns Dean’s lame pickup attempt! And Sam’s remark, “Name three kids that you even know”, cracked me up. Honestly, Jared and Jensen have such great chemistry. They’re so believable as brothers, especially bickering ones. Here is something we’ll see again: Dean bonding with the quiet, seemingly troubled child. It’s touching. I have to note that I’m finding the look/colours of these first three episodes really washed out. Oh boy, drowning in your kitchen sink is a very not great way to go. Plus that’s a really ugly sink. Is that a laundry tub?? 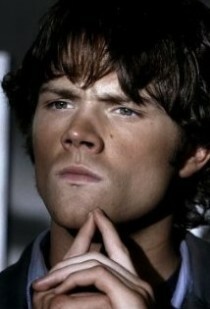 Sam and Dean, trying to figure out what’s killing people, mention a water wraith. Is that something we ever hear of again? I’m pretty intrigued. I love this scene of Sam watching Dean talk about seeing what happened to their mother when she died. I think I forget sometimes that although Sam knows what happened, he doesn’t actually have any memories of it, because he was just a baby. I wonder if he really even has any memories of their mother, or if he only knows her from pictures and what he would have heard from Dean and their father. 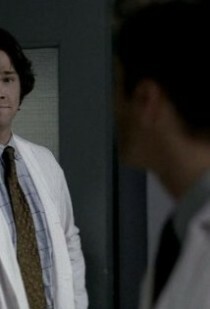 But I love this moment of him watching Dean, maybe understanding something about Dean and why he is the person he is. So Peter, the dead child, is a spirit I assume, one borne of a violent death? I like the backstory, and that it turns out that he was trying to get revenge on the people who killed him so many years ago. I think it’s extra creepy because the spirit is a child. Another Monster of the Week episode, but also an episode that works to strengthen the bond between Sam and Dean. While they talk about their father a bit, there’s no real progress made on that aspect of the story. I also love that they acknowledge that they aren’t going to save everyone. They can’t. But it doesn’t mean they don’t try. The early episodes are so different in tone and theme from the ones I’m currently watching in Season 6 (and Season 7 watching begins tomorrow!!! ); sometimes after the intensity of the later episodes, I find myself almost longing for the ‘Monster Of The Week’ as you call them, shows. I think that’s why the relief in the episodes where they parody their own show have become personal favourites.